Carats and Karats Fine Jewelry and Collectibles celebrates their 26th Anniversary on November 11, 2013. There are many facets to the company and to its owner Brenda Reichel. 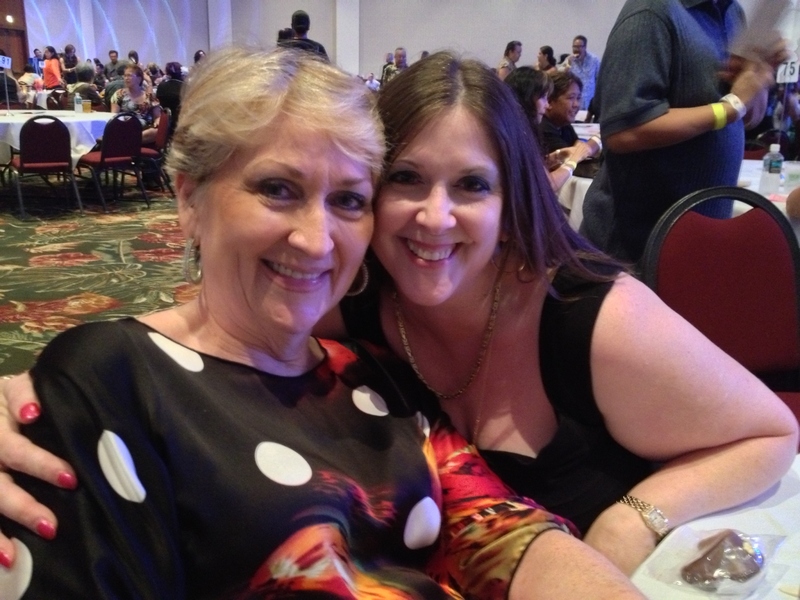 She is not only a smart business woman, but she is a “survivor” and has been a longtime sponsor of Hawaii’s pageants. 1) Brenda’s mother thought of the name Carats and Karats. Carats is a weight of measure for colored stones and diamonds 1.00ct = 1/5 of a gram. so 5.00 carats = 1. gram 31.1 grams = 1 ounce. Karat spelled with a “K” is the karatage of gold 10kt, 14kt, 18kt 22kt 24kt. The logo has a bunny and she likes bunnies and they like carrots. 2) The company has been in business since November 11, 1987. 3) Brenda has been interested in pageants for years. 4) She was a military ball queen in college (Southwest Missouri State University). 5) She believes that everyone should feel like a princess, pageant competitors are all winners because they have the strength and courage to participate and represent Hawaii. 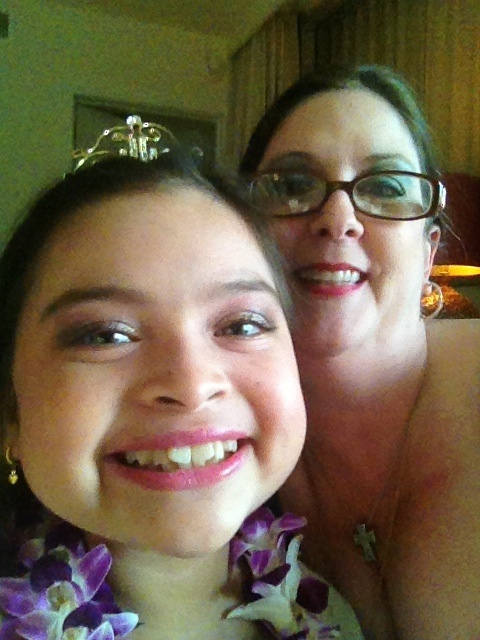 6) Brenda has been donating to pageants since the 1980’s. 7) Carolyn Sapp won her prelim and then won, Miss Hawaii, and on to Miss America. That year, Brenda hand made earrings for all the contestants plus tiaras and Hawaiian bracelets. 8) Lauren Cheape, Miss Hawaii 2011, was canvassing for her run for office last year when a very excited dog bit her hand. Luckily, the bracelet took a brunt of the force and her hand was not majorly harmed. 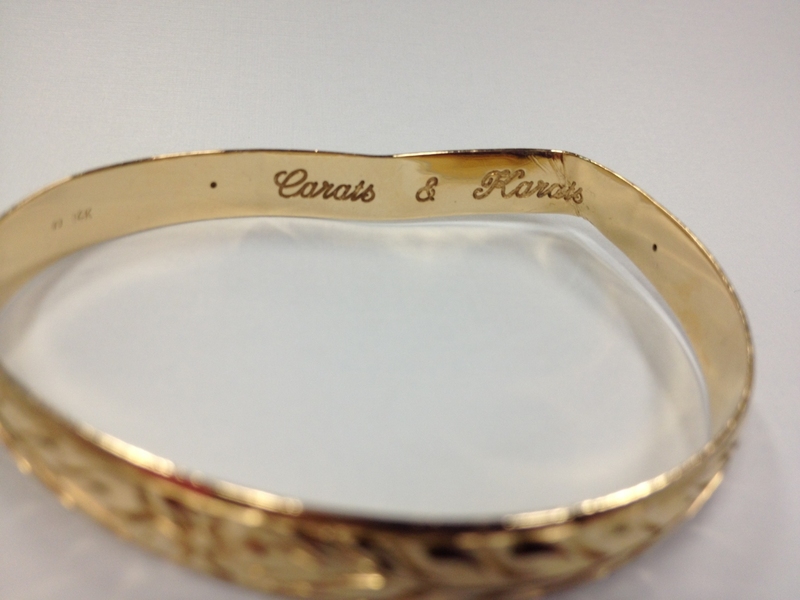 Brenda was able to repair the bracelet and removed most of the dog bite marks. Good thing she makes a sturdy and heavy weight bracelet. 9) Brenda enjoys giving pageant contestants a beautiful gift that they might not otherwise be able to purchase for themselves, during these tough economic times. 10) Brenda contribute to just about all of the preliminary pageants to Miss Hawaii/ Miss America/ Miss Hawaii USA, the teen pageant divisions of both. 11) In the past years, she’s also contributed to Miss Latina, Miss Haleiwa Sea Spree, Miss Universal Show Queen and more. 12) The store’s anniversary is always on November 11, which is also her grandfather’s birthday and is the day she opened the store. 13) Her grandparents were “rock hounds” and started the Ozark Gem and Mineral Club in Springfield Missouri after WWII. So you could say rocks and gems are in the blood. So she picked 11/11 to honor her grandfather. 14) Every year for the store anniversary she makes homemade carrot cake. 15) The Hawaiian Antique Road Show event, with a mainland buyer will be in the store December 9, 10, 11. 16) Those interested are invited to bring in all types of jewelry, gemstones, watches and sterling silver jewelry. 17) She graduated with a Gemologist degree in April 1983. 18) In October 31, 1983, Brenda moved to Hawaii and didn’t know anyone. 19) She admits that she had no idea how long the flight would be. 20) In October 1985, she was diagnosed with melanoma skin cancer and lost a part of her right ear. 21) She was asked to appraise several items of Imelda Marcos. appraised items from a surf shop, the Edwin Locke Missionary Collection. To helping a John Schmidt get his 1968 Super Bowl ring back on his finger with Samuel and Cindy Saffrey. Was on the show Lost and Found on the O Network. Helped with props on Hawaii 5 O. Those diamonds looked really good. 22) In October 1986, her son James Keanu-Reichel was born. She was a parent advocate for parents with children who have learning disabilities. My son James graduated from UH Manoa and is now in working on a Masters in Divinity at Golden Gate Baptist Theological Seminary. 23) In April 1999, she was diagnosed with Immune Thrombocytic Pena purpura (ITP) autoimmune disease. She is in remission. Skylar Soares, of HiSky is one of Brenda’s inspirations. 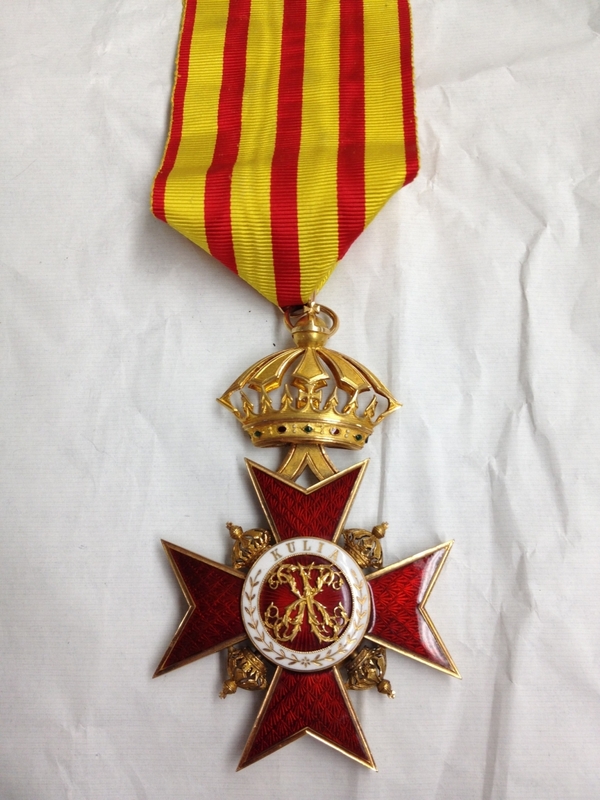 24) She has been teaching gemology at the Honolulu Academy of Arts (now Honolulu Museum Art School) for 18 years. Many of her students have won national awards or had their items showcased and Neiman Marcus. 25) She has been doing a weekly radio show call Gem news for 20 years, live call in radio show, about jewelry, gemstones, antiques and collectibles. Sometimes people call in and sometimes I just talk and talk for the hour. She’s on every Saturday night from 6:00-7:00pm, so listen to her Gemnews live radio show on AM KWAI 1080. 26) Benda is the current Vice President of the Hawaii Rock and Mineral Society. 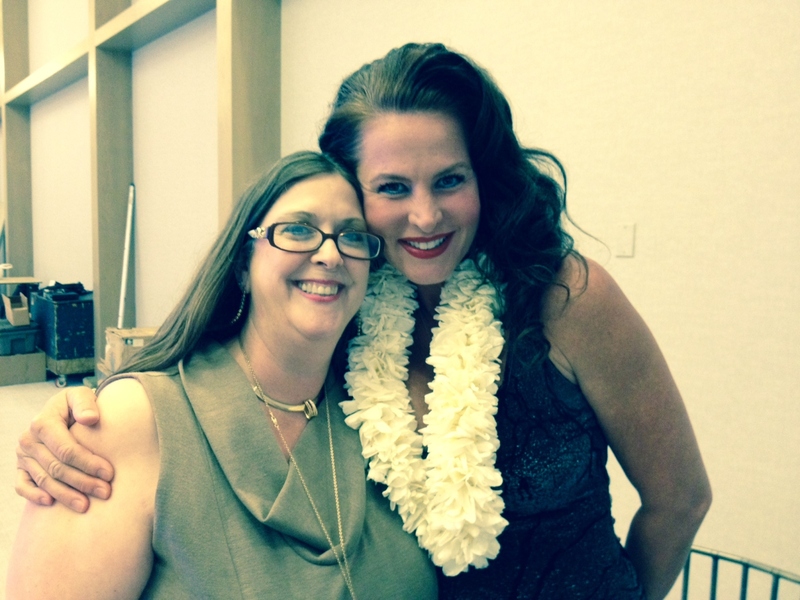 She is also President of the Gemological Institute of America Alumni Association – Hawaii Chapter. The next Holiday Gem Show begins on November 30 at Honolulu Museum Art School.